Caprimulgus is a large and very widespread genus of nightjars, medium-sized nocturnal birds and are found around the world. Temperate species are strongly migratory, wintering in the tropics. They are often referred to as goatsuckers, as they were once believed to drink a nanny's goat's milk during the night (the Latin word for goat-sucker or goat-milker is Caprimulgus). In the past, night-flying birds - such as the nightjars - were suspected of witchery. Nightjars may be heard within their ranges, but they are less often seen - due to their nocturnal habits. Their greyish-brown mottled plumages keep them well camouflaged during the day, when they are also usually hidden away sleeping. Their cryptic appearance - with a plumage that is colored to resemble bark or leaves - blends perfectly into their habitat and they are very difficult to spot during the daytime, when they are usually hidden away sleeping. Some species, unusually for birds, perch along a branch, rather than across it, which further helps to conceal them during the day. They are most easily detected at night when light from car headlights are reflected ruby-red from their eyes, as they are sitting on tracks or roads. However, their presence is most often made known by their loud calls given at dusk. Caprimulgus species have relatively long bills and rictal bristles (whiskers). Many have small feet that are little use for walking. They are mostly active in the late evening and early morning or at night. Many have repetitive and often mechanical songs. The male establishes his territory and sings at night to keep rivals away and at the same time to attract a female. Nightjars don't actually construct a nest, as most other bird species do. They simply place the eggs on the ground on open soil covered with dead leaves. Nesting appears to be timed in such a way that the moon is more than half full at the time they are feeding their young - likely as the additional light during the night facilitates caring for the young and foraging for food. The female may lay one to two eggs (mostly two) that are whitish or creamy in color, with brown and grey spots or blotches. During the day, the incubation of the eggs is undertaken by the female, while both parents share the incubation at night. The incubation period is about 19 to 21 days. The hatchlings are covered in down and are capable of short-distance movements within 24 hours of hatching. They usually move apart shortly after hatching, maybe to make it more difficult for predators to spot them. The parents also shove them apart with their feet as they flush from the nest. The male usually stands guard and defends the nest and the young. He will hover in place near the nest with his body in a nearly vertical position and his tail spread. The adults communicate with their young via soft clucking sounds to which the chicks respond. Both parents feed the young regurgitated food (insects), and they continue to brood them until fledging. The young take their first flight when they are about 20 to 21 days old. If conditions are favorable, the female may lay a second clutch close to the first and while she is incubating the new set of eggs, the male continues to care for the young from first brood. Their nocturnal (night) lifestyle reduces the likelihood of being detected by daytime predators. During the daytime, they typically sleep on the ground where they are perfectly camouflaged by their "earthy" colored plumage. They almost always change their roost sites on a daily basis. When nesting, they sit quietly on the eggs, minimizing any movements that could get them detected. If an intruder does get close to the nest, the parents may try to lead them away by first flushing off the nest and when landing feigning injury as they lead the potential thread away from the nest. While the parent performs this distraction display, the young may scatter and freeze. The parent who is not incubating the eggs or brooding the young will roost away from the nesting area. They may also move the eggs or young to prevent them from being preyed upon. Nightjars avoid voicing when they hear the calls made by predatory nocturnal animals, such as owls. Nightjars are most active, and mostly feed, near dawn and dusk (crepuscular - active during the twilight). At dusk, they often fly around livestock to feed on insects swarming around the animals. At night, they like to take advantage of insects swarming around street lamps or other artificial light sources. They are keeping their bills wide open as they fly through clouds of small insects. Nightjars may also forage under the canopy by flying from favored perches catching insects at foliage heights of 5 - 15 feet (~1.5 - 5 m). Larger insects are usually taken back to their favored feeding perches. While holding the insects in their bills, nightjars keep the head upright, shake and swallow the prey whole, or they may break the insects apart before eating. Insects may also be taken from the ground or foliage. Juvenile nightjars typically sit on the ground before making short jumps or flights to capture insects. The bulk of their diet consists of flying / swarming insects, such as mosquitoes, flies, beetles, locusts, winged ants, moths and grasshoppers, as well as plant lice and crickets. To a lesser extent, they will also eat larvae, nymphs and eggs. They may also eat small birds, also swallowing them whole. They drink while flying slowly over a water surface scooping up water with their wide beak. The beak has evolved to be much wider than it is long, and it opens wide both - vertically as well as horizontally. The resulting big gaping mouth allows it to more easily scoop up insects in flight. Its large eyes are placed on each side of the head (laterally) - which significantly increases its visual field. A reflective membrane behind the retina (tapetum) enhances its vision at night by augmenting the light-gathering ability of its eyes. They also have forward-facing whiskers that may either help them funnel food into the mouth or protect the eyes. Rufous Nightjar, Caprimulgus rufus : Found in Argentina, Bolivia, Brazil, Colombia, Costa Rica, Ecuador, French Guiana, Guyana, Panama, Paraguay, Peru, Saint Lucia, Suriname, Trinidad and Tobago, and Venezuela. Its inhabits subtropical or tropical dry forests, moist lowland forests, and heavily degraded former forest. 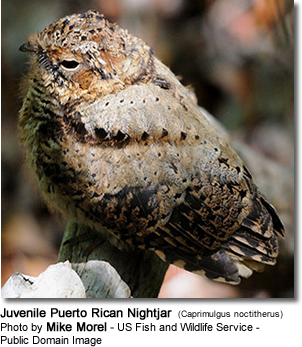 Hispaniolan Nightjar, Caprimulgus ekmani : Found in the Dominican Republic and Haiti. Tawny-collared Nightjar, Caprimulgus salvini : Found in Mexico and Nicaragua. It inhabits subtropical or tropical dry forests. Yucatan Nightjar, Caprimulgus badius : Found in Belize, Guatemala, Mexico, Nicaragua, and possibly Honduras. It inhabits subtropical or tropical dry forests. Silky-tailed Nightjar, Caprimulgus sericocaudatus : Found in Argentina, Bolivia, Brazil, Paraguay, and Peru. It inhabits subtropical or tropical moist lowland forests. Buff-collared Nightjar, Caprimulgus ridgwayi : The Buff-collared Nightjar, Caprimulgus ridgwayi, is a small sized nightjar. The adults are dark with brown, grey, black and white patterning on the upperparts and breast. The tail is dark brown, with darker finely barred markings throughout. The male has large white outer tail tips on the 3 outermost tail feathers. The female has buffy tail tips. The most distinguishing characteristic to determine its identity from its closest relative the Whip-poor-will is from where the bird gets its name. It shows a prominent buff-colored collar around its neck and nape (back of the neck). Its song is also very different. It sounds like an accelerating cuk, cuk, cuk, cuk, cuk, cukacheea. Their breeding habitat is open country of Mexico and Central America to central Nicaragua. The northern limit of its range reaches just over the Mexican border to southeasternmost Arizona and southwesternmost New Mexico–(the Madrean sky islands in the eastern Sonoran Desert mountain region). The nightjar's two eggs are laid directly on bare ground near rocks or scrubby vegetation—there is no nest. The adult may feign injury to distract an intruder from the eggs or young birds. They catch flying insects on the wing, making forays to catch its pray from the ground or a perch from a bush, tree or large rock. It is mainly active at night, but can also be awake at dawn or dusk. It usually rests on the ground during the day. Buff-collared nightjar is named for Robert Ridgway, pioneering American ornithologist of the 1800s. Dusky Nightjar, Caprimulgus saturatus : Found in Costa Rica and Panama. Its natural habitats are subtropical or tropical moist montanes and heavily degraded former forest. Pygmy Nightjar, Caprimulgus hirundinaceus : Endemic to Brazil. This bird species inhabits subtropical or tropical dry forests. Spot-tailed Nightjar, Caprimulgus maculicaudus : Found in Bolivia, Brazil, Colombia, French Guiana, Guyana, Honduras, Mexico, Nicaragua, Paraguay, Peru, Suriname, Venezuela, and possibly Ecuador. Its natural habitats are dry savanna and subtropical or tropical seasonally wet or flooded lowland grassland. Scrub Nightjar, Caprimulgus anthonyi : Found in Ecuador and Peru. Cayenne Nightjar, Caprimulgus maculosus : The Cayenne Nightjar Caprimulgus maculosus is currently only known from a single specimen taken on the Fleuve Mana, French Guiana. A possible female was caught at the Saül airstrip, French Guiana. This is a small, brown variegated neotropical nightjar, 22.5cm in length. It is known only from a single specimen, a male. Upperparts greyish-brown, broadly streaked blackish-brown on crown and nape. Narrow, indistinct tawny collar on hindneck. Wing-coverts greyish-brown heavily spotted buff; scapulars (shoulder feathers) blackish-brown, broadly edged buff. Large white patch either side of lower throat. Underparts buff heavily barred brown. Blackish Nightjar, Caprimulgus nigrescens : Found in Bolivia, Brazil, Colombia, Ecuador, French Guiana, Guyana, Peru, Suriname, and Venezuela. Its natural habitats are subtropical or tropical moist lowland forests and subtropical or tropical dry shrubland. Roraiman Nightjar, Caprimulgus whitelyi : Found in Brazil and Venezuela. Its natural habitats are subtropical or tropical moist montanes and subtropical or tropical high-altitude shrubland. Brown Nightjar, Caprimulgus binotatus :Found in Cameroon, Central African Republic, Republic of the Congo, Democratic Republic of the Congo, Ivory Coast, Gabon, Ghana, and Liberia. Red-necked Nightjar, Caprimulgus ruficollis : The Red-necked Nightjar, Caprimulgus ruficollis, is the largest nightjar which occurs in Europe. It breeds in Iberia and north Africa, and winters in tropical west Africa. It is a late migrant, seldom appearing before the end of April or beginning of May. Open sandy heaths with trees or bushes are the haunts of this crepuscular (active during the twilight) Nightjar. It flies at dusk, most often at sundown, with an easy, silent moth-like flight; its strong and deliberate wingbeats alternate with graceful sweeps and wheels with motionless wings. The variegated plumage resembles the European Nightjar. The adult is lichen-grey, barred and streaked with buff, chestnut and black. The under parts are barred. It is larger and longer-tailed than the more widespread species, and has a rufous neck-collar. Like other nightjars, it has a wide gape, long wings, soft downy plumage and nocturnal habits. Both sexes have white wing spots, tail sides and throat. The length is 32cm, and the wingspan 64cm. Its call is a repetitive mechanical kyok-kyok-kyok…., which rises and falls as the bird turns its head from side to side. When it churrs, the bird lies or crouches along a branch or rail, but it will sing from a post. During courtship, and occasionally at other times, it uses a mechanical signal, a sharp cracking sound, caused by clapping the wings together over the back. Crepuscular (active during twilight) insects, such as moths, are its food. During the day this nightjar lies silent upon the ground, concealed by its plumage; it is difficult to detect, looking like a bit of lichen-covered twig or a fragment of bark. No nest is made; the two elongated and elliptical eggs are placed upon the bare ground; the brooding bird, sitting closely, is their best protection. Grey Nightjar, Caprimulgus indicus : Endemic to Madagascar. It inhabits subtropical or tropical moist lowland and mangrove forests. Sombre Nightjar, Caprimulgus fraenatus : Found in Angola, Botswana, Burundi, Eritrea, Ethiopia, Kenya, Malawi, Mozambique, Namibia, Somalia, South Africa, Sudan, Tanzania, Uganda, Zambia, and Zimbabwe. Rufous-cheeked Nightjar, Caprimulgus rufigena : Found in Angola, Botswana, Cameroon, Chad, Republic of the Congo, Democratic Republic of the Congo, Mozambique, Namibia, Nigeria, South Africa, Sudan, Zambia, and Zimbabwe. Nubian Nightjar, Caprimulgus nubicus : Found in Djibouti, Egypt, Eritrea, Ethiopia, Israel, Kenya, Oman, Saudi Arabia, Somalia, Sudan, and Yemen. Sykes's Nightjar, Caprimulgus mahrattensis : Found in South Asia. Vaurie's Nightjar, Caprimulgus centralasicus : Endemic to China. Its natural habitat is cold desert. The continued existence of this species is threatened by habitat destruction.This bird is only known from a single 1929 specimen from Xinjiang, China. It has never been found again, and it is quite possibly invalid as it has not yet been compared to the similar subspecies of the European Nightjar, C. europaeus plumipes, which occurs at the locality where C. centralasicus was found. Golden Nightjar, Caprimulgus eximius : Found in Chad, Mali, Mauritania, Niger, Nigeria, Senegal, and Sudan. Jerdon's Nightjar Caprimulgus atripennis : A resident breeder in southern India and Sri Lanka. Open woodland, scrub, and cultivation is the habitat of this nocturnal bird. It flies after sundown with an easy, silent moth-like flight. During the day, Jerdon's Nightjar lies silent upon the ground, concealed by its plumage; it is then difficult to detect, blending in with the soil. No nest is made; the two beautifully marbled eggs are placed upon the bare ground; the brooding bird, sitting closely, is their best protection. Unlike Indian Nightjar, this species rarely rests on roads during the night, preferring to alight on bushes. This makes it harder to spot, since it is not so readily seen in vehicle headlights. Jerdon's Nightjar has variegated buff and brown plumage. At 28cm length, it is obviously larger than Indian Nightjar, and differs from that species in its barred tail, rufous rear neck, and wing bars. The male has a white patch on each wing. Like other nightjars, it has a wide gape, long wings, soft downy plumage and nocturnal habits. Its call is a fast repetitive ch-woo-woo. Nocturnal insects, such as moths, are its food. This species was earlier considered synonymous with the Large-tailed Nightjar Caprimulgus macrourus which occurs in northern India. Large-tailed Nightjar, Caprimulgus macrurus : Found in Australia, Bangladesh, Bhutan, Brunei, Cambodia, China, India, Indonesia, Laos, Malaysia, Myanmar, Nepal, Pakistan, Papua New Guinea, the Philippines, Singapore, Thailand, and Vietnam. Its natural habitats are subtropical or tropical moist lowland forests, subtropical or tropical mangrove forests, and subtropical or tropical moist montanes. Andaman Nightjar, Caprimulgus andamanicus : Found in the Andaman Islands. 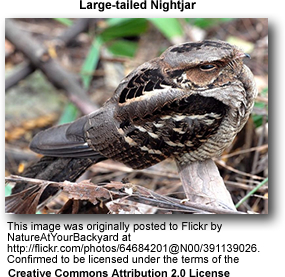 It is sometimes considered a subspecies of the Large-tailed Nightjar, however the song and morphology are distinct. The species is found in most of the islands in the Andamans and calls suggest it may be possible in the Narcondam Island as well. It is said to be common in teak forest and open country with scattered trees. 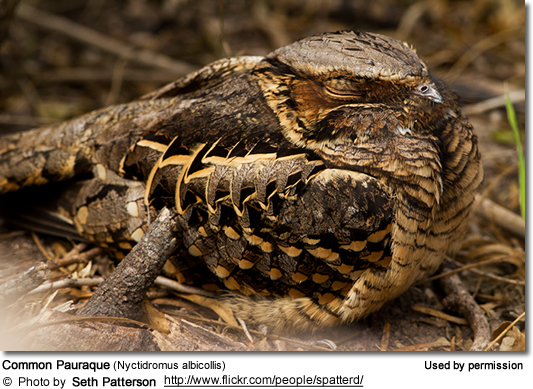 The call is a tyuk lacking the following tremolo that is heard in the Large-tailed Nightjar and more rapidly repeated. Mees's Nightjar, Caprimulgus meesi : Described as new to science in 2004. It is a representative of the Large-tailed Nightjar complex found on Flores and Sumba, Indonesia. Previously unrecognised as a separate taxon due to its lack of morphological distinctness, Sangster and Rozendaal (2004) described this new species on the basis of its vocalisations, which differ significantly from those of the Large-tailed Nightjar races resident on other islands in the Lesser Sundas. The species is named after Gerlof Mees, former curator of the Natural History Museum, Leiden. Philippine Nightjar, Caprimulgus manillensis : Endemic to the Philippines. Its natural habitats are subtropical or tropical moist lowland forests, subtropical or tropical mangrove forests, and subtropical or tropical moist montanes. Sulawesi Nightjar, Caprimulgus celebensis : Endemic to Indonesia. It inhabits subtropical or tropical moist lowland and mangrove forests. Donaldson-Smith's Nightjar, Caprimulgus donaldsoni : Found in Ethiopia, Kenya, Somalia, Sudan, and Tanzania. Black-shouldered Nightjar, Caprimulgus nigriscapularis : Found in Angola, Benin, Burundi, Cameroon, Central African Republic, Republic of the Congo, Democratic Republic of the Congo, Ivory Coast, Equatorial Guinea, Gabon, Gambia, Ghana, Guinea, Guinea-Bissau, Kenya, Liberia, Nigeria, Rwanda, Sierra Leone, Sudan, Togo, and Uganda. Fiery-necked Nightjar, Caprimulgus pectoralis : Found in Angola, Botswana, Democratic Republic of the Congo, Gabon, Kenya, Malawi, Mozambique, Namibia, South Africa, Swaziland, Tanzania, Zambia, and Zimbabwe. Montane Nightjar, Caprimulgus poliocephalus : Found in Angola, Democratic Republic of the Congo, Eritrea, Ethiopia, Kenya, Malawi, Saudi Arabia, Sudan, Tanzania, Uganda, and Zambia. Ruwenzori Nightjar, Caprimulgus ruwenzorii : Found in Burundi, Democratic Republic of the Congo, Rwanda, and Uganda. Indian Nightjar, Caprimulgus asiaticus : A resident breeder in India, Sri Lanka, and Southeast Asia. Open woodland, scrub, and cultivation is the habitat of this nocturnal bird. It flies after sundown with an easy, silent moth-like flight. During the day, Indian Nightjar lies silent upon the ground, concealed by its plumage; it is then difficult to detect, blending in with the soil. No nest is made; the two beautifully marbled eggs are placed upon the bare ground; the brooding bird, sitting closely, is their best protection. This common species frequently rests on roads during the night. This makes it easy to find in suitable habitat, since it is readily seen in vehicle headlights. Indian Nightjar has variegated buff and brown plumage. At 24cm length, it is smaller than Jerdon's Nightjar, and differs from that species in its plainer tail, buff rear neck, and boldly marked shoulder feathers. It has a white patch on each wing. Like other nightjars, it has a wide gape, long wings, soft downy plumage and nocturnal habits. Its call is a loud repetitive chuk-chuk-chuk-chuk. Nocturnal insects, such as moths, are its food. Madagascar Nightjar, Caprimulgus madagascariensis : Found in Comoros, Madagascar, Mayotte, and Seychelles. They inhabit subtropical or tropical moist lowland forests and moist montanes. Swamp Nightjar, Caprimulgus natalensis : Found in Angola, Botswana, Burundi, Cameroon, Chad, Republic of the Congo, Democratic Republic of the Congo, Ivory Coast, Gabon, Gambia, Ghana, Kenya, Liberia, Mali, Mozambique, Namibia, Nigeria, Rwanda, Sierra Leone, South Africa, Sudan, Tanzania, Uganda, Zambia, and Zimbabwe. Plain Nightjar, Caprimulgus inornatus : Found in Benin, Burkina Faso, Burundi, Cameroon, Central African Republic, Chad, Democratic Republic of the Congo, Ivory Coast, Djibouti, Eritrea, Ethiopia, Gabon, Ghana, Guinea, Kenya, Liberia, Mali, Mauritania, Niger, Nigeria, Senegal, Sierra Leone, Somalia, Sudan, Tanzania, Togo, Uganda, and Yemen. Star-spotted Nightjar, Caprimulgus stellatus: Found in Ethiopia, Kenya, Somalia, and Sudan. Savanna Nightjar, Caprimulgus affinis : Found in South Asia, usually in the Phillipines. Freckled Nightjar, Caprimulgus tristigma : Found in Angola, Benin, Botswana, Burkina Faso, Burundi, Cameroon, Central African Republic, Republic of the Congo, Democratic Republic of the Congo, Ivory Coast, Ethiopia, Gabon, Ghana, Guinea, Kenya, Liberia, Malawi, Mali, Mozambique, Namibia, Niger, Nigeria, Rwanda, Sierra Leone, South Africa, Sudan, Swaziland, Tanzania, Togo, Uganda, Zambia, and Zimbabwe. Bonaparte's Nightjar, Caprimulgus concretus : Found in Brunei, Indonesia, and Malaysia. It inhabits subtropical or tropical moist lowland forests. The continued existence of this species is threatened by habitat destruction. Salvadori's Nightjar, Caprimulgus pulchellus : Endemic to Indonesia. They inhabit subtropical or tropical moist lowland forests and moist montanes. The continued existence of this species is threatened by habitat destruction. Itombwe Nightjar, Caprimulgus prigoginei : Breeds in tropical central Africa. It is known from only one specimen taken in Democratic Republic of the Congo (formerly Zaire) in February 1952. It is appears to be a forest species, but nothing is known of its habits or breeding, although it is likely to nest on bare ground like its relatives. It is assumed to be a nocturnal insectivore like other nightjars. Prigogine's Nightjar is a small nightjar at 19 cm, short tailed and large headed. The adult female is dark brown with heavy speckling. In flight it is again mainly brown, without the white wing marking found in many of its relatives. There are pale brown wing spots, and whitish tail feather tips. The male is unknown. The male's song is unknown, but unidentified nightjar calls heard in the breeding area include a rapid churring, and a knocking sound. Collared Nightjar, Caprimulgus enarratus: Endemic to Madagascar. It inhabits subtropical or tropical moist lowland and mangrove forests. Bates's Nightjar, Caprimulgus batesi : Found in Cameroon, Central African Republic, Republic of the Congo, Democratic Republic of the Congo, Gabon, and Uganda. Long-tailed Nightjar, Caprimulgus climacurus : Found in Angola, Benin, Burkina Faso, Cameroon, Central African Republic, Chad, Republic of the Congo, Democratic Republic of the Congo, Ivory Coast, Eritrea, Ethiopia, Gabon, Gambia, Ghana, Guinea, Guinea-Bissau, Kenya, Liberia, Mali, Mauritania, Niger, Nigeria, Senegal, Sierra Leone, Sudan, Tanzania, Togo, and Uganda. Slender-tailed Nightjar, Caprimulgus clarus: Found in Democratic Republic of the Congo, Ethiopia, Kenya, Somalia, Sudan, Tanzania, and Uganda.